In the Tarot, these concepts are represented by the Fool. This wise character helps us take the first step of our journey, enabling us to trust in the universe with faith. In Zen this is called Shoshin, or beginner’s mind. Humor and spontaneity are key tools on the Fool’s Journey as we trust our natural responses. So follow your heart and believe in yourself! You are a gift to the world! All individual in-person readings take place in San Francisco and must be made by appointment. I am now available for house calls! Skype and phone readings are still available and are an effective way to receive information if you are not located in San Francisco. Couples readings are also available! Having a party? Celebrating your Birthday? 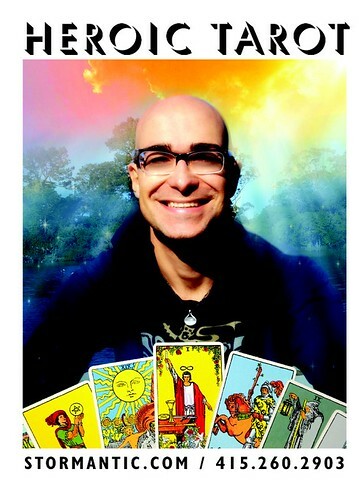 Book Heroic Tarot for your event! I wish you all a joyous January!